It's usually a pretty small request, but if there's one thing you don't sign up for when you're admitted to the hospital is privacy. Like, forget it. Finally get to sleep? Wake up! Time to take some blood! Have to pee? Someone's knocking on the door making sure you're not unconscious on the toilet. Trying to interview a celebrity during the nurses's shift change? Good luck. "And so what about being on set? Did you and the rest of the cast have a lot of chances to get to know each other?" 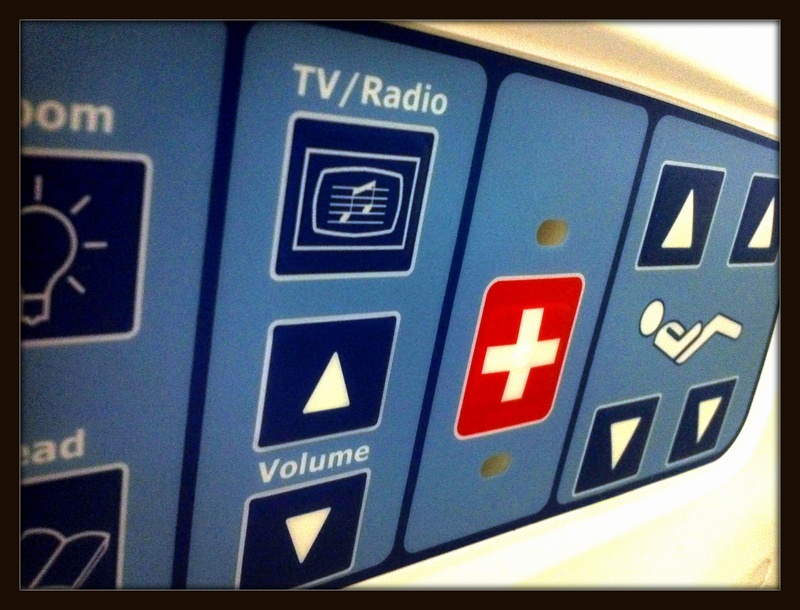 My IV keeps beeping and the little screen on its pole keeps flashing the words "LINE OCCLUDED -- FLUSH LINE." But no one is flushing anything while I'm still on a private line with a primetime celebrity. Besides, I think, if I just hold my left hand really still it will clear up by itself. Until then, I'm frantically pressing the "Silence" button every three and a half minutes and holding the phone between my ear and shoulder while trying to type everything verbatim with one hand. Hey, no one said working with a chronic disease was going to be a cakewalk. But compared to trying to win a case for disability when your disease doesn't include bleeding from the eyeballs or randomly losing your limbs, it's a breeze. "How do you think your character has evolved since last season?" If I'm going to be honest, I would say that I probably am a quitter. I probably did take the easier way out. When I was diagnosed with primary immune deficiency and dysautonomia -- diseases which complicated every part of my immune and autonomic nervous system -- I thought my career was over. I would have to rely on the system to support me for the rest of my life. And I was only 20 years old. It was a little premature for retirement. The nurse bursts in without knocking and starts to ask me if I need more medication -- I throw my IV'd hand up and mouth "CAN'T TALK -- WORKING" -- sheepishly lowering my arm after I almost jerk the plastic catheter out of my skin. She rolls her eyes and walks back out. Anyways, applying for disability had been a nightmare. Even with a lawyer who worked pro-bono through one of the Immune Deficiency organizations. The paper work was overwhelming and the truth was that even with everything in perfect order -- I only had a miniscule chance of actually getting covered. Being hospitalized every other week for out of control symptoms doesn't qualify you for jack. I spoke with a Facebook friend the other day who lives in Ohio. She's had at least six brain surgeries this year. She can't walk anymore and spends most of her days getting spinal taps to drain fluid from her skull. She was denied disability in December and needs to recoup financially before she can even think about trying again with a lawyer. So I'm not exactly sure who or what qualifies you for support, but the universe is pretty much giving her no options but to slap a band-aid on her scalp and start sending out resumes. My interview wraps up with a lot of thank you's and apologies about my slow-typing. I hang up the phone and try to air the sweat out from underneath my arms. Interviews kind of stress me out -- but only in the way that I'm totally out of practice when it comes to working with other people. For the past year and a half I've been working from home -- freelance writing articles, public relations copy, pitching stories all via email. I've got a 90-percent response rate on return emails from editors. But between the brain fog from my actual disease and the residual cloudiness of my medications -- my tongue isn't quite as sharp as it used to be and I get serious anxiety about getting on the phone with anyone who I'll have to actually try to have a conversation with. The nurse comes back in and starts pressing buttons on my IV. My line is filled with bright red blood, but with a few more clicks everything turns clear again. I sink back into my bed, making a mental note to add one of those travel-size sticks of deodorant to my hospital kit. "Working when you're in the hospital?" The nurse asks. "You should take this time to relax and heal." Which is like, totally zen and wholesome -- but I have a dog with food allergies who needs a specialized organic kibble. And my AMEX bill for last month? Let's not even go there. It's different for the chronically ill. There are no sick days, no paid time off -- they are all sick days. There is no "welcome back, glad you're feeling better." There's just absence, and a whole lot of unemployment. And after a while, you just get tired of wondering if today is going to be a good health day or a bad health day. So you make the decision to expect all days to be bad health days and start changing the design of your life to handle the impact. Two story houses turn to one. Romantic date nights out become House of Cards marathons and Greek take-out. College and career stop looking like classrooms and boardrooms and start looking like Skype sessions and FreeConferenceCall.com. And once I started working for The Global Genes Project -- an international non-profit focused on rare diseases -- I started getting stories just like my own from patients daily. They were sick, but weren't getting the support they needed. I started wondering how many other patients on my floor were mixing flare-ups with full-time telecommuting? And when I asked the rare and chronic disease community for their solutions to life-interrupted I was admittedly pretty blown away by the response I got. After doctors diagnosed her with an acquired brain injury, Encephalitis, from a mosquito bite, it took 38-year-old Becky Dennis a full 27 months to understand the impact of her health on her career. Just like me, she experienced the anxiety of interacting as a professional when her disease weakened her ability to communicate. It was a time in her life that called into question her creativity. She found ways to work around it. "If I had to conduct a briefing, I scripted it out. If I had a business dinner, I brought a colleague and compared notes afterward to "borrow" their memory. I carried a notebook with me everywhere to jot down items I needed to remember. I scheduled meetings around my numerous doctor appointments, blocking my calendar to appear otherwise busy," remembers Dennis. Crohn's Disease patient Lori Karpman was among the many who had to have a complete career change post-diagnosis. "I was the President of my own chain of franchised restaurants called Zyng Noodlery," says Karpman who now works from home as a business consultant "I have a very successful business, but I have to be at home because I have stomach cramps every morning and often throughout the day and need to be near a washroom. My whole life has changed, and I have a new "normal" now. The Global Genes series ushered in mountains of feedback from patients who read their stories and felt relief. Long lonely roads of disability and isolation warped in the possibility of a normal life. There were pieces to be moved around but what is that quaint little saying? I knew there must be a way to circumvent the symptoms of my disease -- just like anyone would supplement for a lack of education or experience. The trick was being persistent and aggressive. Once you're a patient with a chronic illness it can consume your identity. You spend so much time and energy devoted to just feeling better -- you can't imagine being anything more than what you're struggling to manage right now. You think, I can't be a mom or a wife or an employee. You think, I can't do it. But the plain, verifiable, quiet -- but rarely said fact is that people do. With technology being at it's most advanced it has never been a more possible dream than to not have to give up your life in order to manage your disease. It's happening in the waiting room on an iPad in-between filling out insurance information. It's happening on a conference call on a treadmill in physical therapy. It's even happening to a girl in a hospital bed drafting up an article while waiting for an IV line to be reset. Read more from Ilana at Let's Feel Better.